OK - a ridiculously long post so skip to the end if you're just here to leech a couple of Luna rarities! In Summer 1997 I had this half-baked idea to release a kind of Beatles Fan Club single only with Galaxie 500 rather than The Beatles. I had no idea, when I kicked off, just what I thought it might be like. So... I wrote (on paper with stamps and things) to Damon & Naomi just to test the ground. I got a lovely letter back from Naomi saying that they'd rather not get involved as Damon & Naomi, and that apart from The Peel Sessions they didn't have any Galaxie 500 unreleased material that they wanted to release "we were never that prolific" so, with that knockback I forgot about it. In October 1997 I spoke to Dean Wareham after Luna's show at the LA2 in London, it was little more than a "hi you were great... would you sign my ticket" but it was the ice-breaker. Later that week he called and left a phone message for me (see Dean Wareham moment #2) and that lit the fire under my plans again... after all... we were mates now! 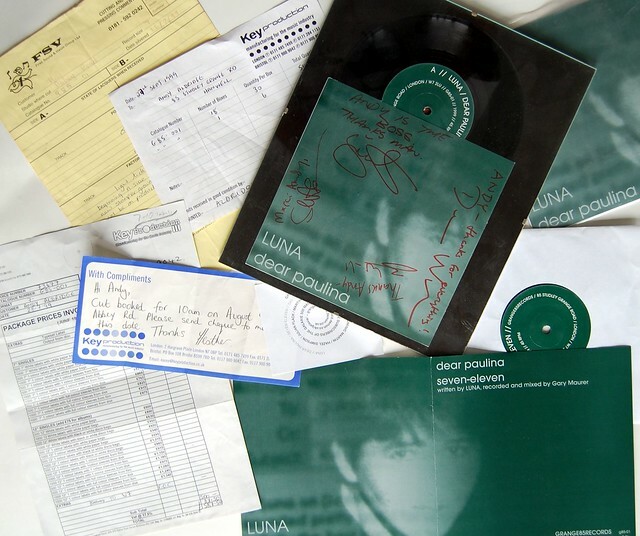 The idea cooked away for a year (nothing moves particularly fast in my world) and in the spring of 1999 I emailed Dean and asked if I could put out a Luna single. He emailed back saying yes and suggested that he'll talk with the band and pull out a demo I could release (I, sadly, have long since lost the email so I can't remember the details). A couple of months later a package arrived at the door with a DAT and details of the tracks that I should put on the single. No demos or live tracks for me... these were genuine... unreleased... luna rarities. The a-side track Dear Paulina was taken from the (cult but actually pretty unpleasant) film Thursday and featured during a scene in which Dallas (played by Paulina Porizkova) rapes Casey (you can see the scene on YouTube but it's obviously NSFW). The b-side, Seven-Eleven, was some near-instrumental music also from the film. So I had some music but absolutely no idea at all what I was supposed to do now... so I got in touch out of the blue with Dom from the London indie Earworm records who had been putting out lots of lovely singles... he in turn pointed me towards a company that would arrange the cut and press the single, Key Production, and another that would print the artwork. On the 9th of August Hazel and I went to Abbey Road Studios (yes that Abbey Road) to oversee the cutting of the masters - of course we knew nothing and just went along for the ride with little more than Dom's advice which was something along the lines of "don't let them mess with it." I knew nothing about the film and had no idea who Paulina might be so for the sleeve art I threw together with my very limited Photoshop skills a picture of Hazel overlayed with a what was supposed to be the reflection of a computer monitor showing an email being written. A reference to the Galaxie 500 Mailing List... and you know... "Dear Paulina" sounded like a greeting at the beginning of an email. I'm no designer or artist so I didn't expect great things and all I really intended was that it would be better than a cat nailed to a board. I had help from my designer friend Julian preparing it for print and sent it off. Over the next few weeks everything but the singles turned up at my house. It was odd having 500 sleeves, 500 plastic covers, 500 mailing envelopes and a strange nagging doubt that the record was a bizarre dream. In mid September I finally received a batch of test pressings. While they were good to hear they were also worryingly not perfect. Key reassured me that the production run would be just fine... and not having anyone else to trust I chose to trust them. On the 27 September I took delivery of 546 seven inch singles - I'm still not entirely sure why 546, 46 more than I had printed sleeves for. Over the next few weeks I mailed out 250 or so of these. In the days before Paypal, taking orders over the Internet was a headache and the singles were sold for a "carefully concealed 5 dollar bill." I eventually sold quite a lot of them but nowhere near enough to cover the costs. The single got the Tower Records Single of the Week in Irish paper Hot Press, which led to Tower Records desperately getting in touch with me to get some copies into their shops (which the bastards NEVER paid me for). I paid Luna in singles which they sold at their shows or put into shops in NYC. In February 2000 Hazel and I went to New York City to see Luna and gave them most of the copies that I had left - they had more chance of selling them than I did. Looking back it all seems like a dream and only looking at Hazel's face on the sleeve and our address on the label reassures me that it all really did happen. I lost a stack of money but then it wasn't about making money and I didn't really expect to make any. It was all an absolute blast.